Beginning last year (2013), the Tibetan Women’s Association (TWA) carried out a special year-long project titled ‘The Legal Empowerment of Tibetan Women in Exile (LETWIE).’ The project received financial backing from KIOS (Finnish foundation for human rights). The sole aim of the project is to enable the social status of Tibetan women in exile to match the significance and vigor underlying the tenets and maxim of Tibetan democracy and human rights. It is also aimed to ensure that the exiled Tibetan population achieves a gender equal and healthy environment wherein women are protected against any form of discrimination, risk and violence. With this undertaking, TWA reached out to Tibetan women across India and undertook an intensive education and awareness raising campaign, imparted training on topics such as; gender sensitization, combating gendered violence and awareness on the Indian laws protecting Tibetan women in India. The LETWIE-Action Team also engaged in a massive field-survey that had over 500 women fill out a questionnaire and an in-depth oral interview, the results of which are being assessed now. An important component of the LETWIE project is the two-day symposium: a gathering of legal experts, women activists, grassroots leaders, stakeholders, representatives of civil society and the media. The gathering will discuss the gender status and social of Tibetan women in exile India based on the findings of the field research and survey carried out by LETWIE team across India. It will also engage in a dialogue to devise social programs and legal measures to combat the discrimination and violence facing women, while seeking to create a gender equal society and achieve social empowerment for Tibetan women exile. 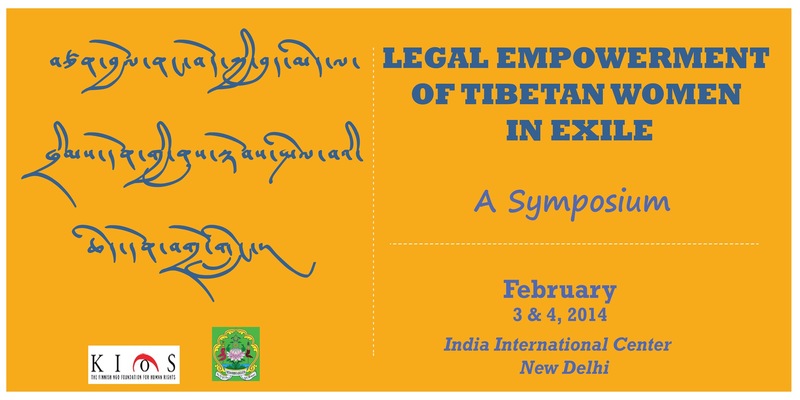 The symposium will be attended by 50 people from different sections of the society and will be held on February 3 and 4 of 2014 at the India International Centre, New Delhi. 11 am – 01 pm : Presentation and Discussion on Social and Legal issues facing Tibetan Women in Exile. Presentation by: Tsering Choedon, Advocate and Project Coordinator, Legal Empowerment of Tibetan Women in Exile. Large Group Discussion: on the Social and Legal Issues presented in the Findings. Dialogue Chair, Dhardon Sharling, Creative Head, Legal Empowerment of Tibetan Women in Exile. 11:30 am – 01:30 pm: Sharing…. on Field Survey Results / Ground Observation by Legal Empowerment of Tibetan Women in Exile, Action Team (LETWIE-AT).